GWEN started with a formation workshop, in Greece at Navarino Environmental Observatory (NEO), Costa Navarino, Peloponnesos, Greece, October 20-26, 2011. The workshop was hosted by Prof. Georgia Destouni from Stockholm University, with an international group of researchers as participants (see participants list here) that met to discuss and establish the network; now knows as GWEN. The first Phase of GWEN was finalized in 2017 with the joint, multi-author paper on wetlands as nature-based solutions, which you can read here! 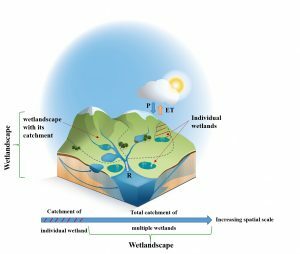 Graphical abstract of the paper showing a conceptual sketch of a wetlandscape. 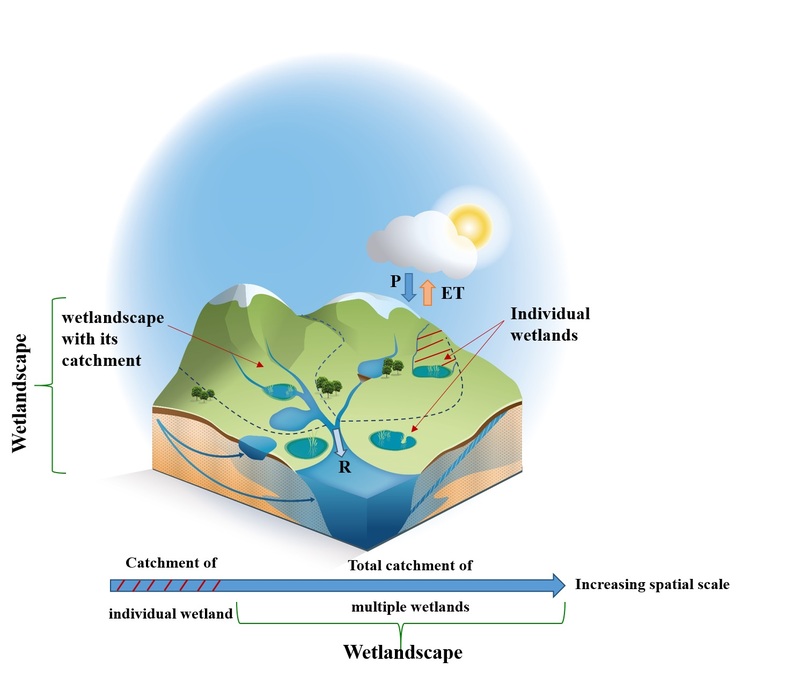 A wetlandscape consists of multiple wetlands that are hydrologically connected within an associated larger hydrological catchment than that of an individual wetland. The associated large-scale water fluxes; precipitation (P), evapotranspiration (ET), runoff (R) and groundwater (GW) flows are represented by arrows in the landscape. A wetlandscape and its associated total catchment is not a static unit but will be defined at and represent various spatial scales (exemplified by dashed lines).